Under pressure from federal health regulators, the manufacturer of two popular sports supplements has voluntarily destroyed the inventory of the products, the Food and Drug Administration said on Tuesday. The products made by USPlabs of Dallas, called Jack3d and OxyElite Pro, had a retail value of more than $8 million, the agency said. The action reflects an escalating federal crackdown on workout boosters and fat-burning products that contain an amphetaminelike stimulant called dimethylamylamine, or DMAA for short. In April, the F.D.A. issued a public advisory saying that the stimulant was an illegal dietary ingredient and could pose serious health risks to consumers. Health regulators said the stimulant could elevate blood pressure, potentially leading to heart attacks, and warned consumers not to take it. Soon after, USPlabs said that it would, for business reasons, stop producing DMAA products and market formulations without the stimulant. But the company continued to distribute its remaining inventory of the original Jack3d and OxyElite Pro, the F.D.A. said, which prompted the agency to issue an administrative detainment order for the products and ask the company to destroy them. USPlabs destroyed the DMAA products at a company warehouse in Dallas on July 2, the agency said. USPlabs did not immediately return an e-mail and a call seeking comment. The F.D.A. 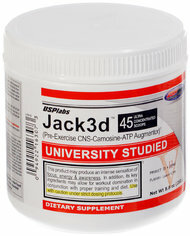 has also recently taken action against GNC, the nation’s largest specialty retailer of dietary supplements, which has continued to sell Jack3d. Last month, federal prosecutors asked judges in two states to authorize the seizure of more than 3,200 cases of DMAA products from GNC warehouses in Pittsburgh and Anderson, S.C.